by my oncologist, Dr. Mead, because of Diffuse Large B-Cell Lymphoma (DLBCL) Primary non-Hodgkin of Liver Stage IV. It was a terribly hard (actually, “hard” is not a strong enough word for what I went through) time of darkness, fear, pain, suffering, and sadness. Even now, everyday, I face dying—and this is not exaggerated. But I am still living with the feeling of my life more than ever. There is the phrase “bucket list” in English. I wrote my bucket list for the first time after I was told I had only weeks to live. My first item was to recover from lymphoma of liver. Since I love to do many things and enjoy my life, so I wrote many other items on the list. The fifth item was “Going to a live concert of Yuming,” a Japanese singer/songwriter who has been my favorite since I was in high school. Her song helped me a lot when I was going through late teenager challenging time. As you see on the top photo I took Yuming’s newest 45th- anniversary special CD “Love songs from Yuming” with my stainless steel bucket (I use this bucket every morning for my body scrub) and one of my favorite flowers, freesia from my garden which was planted when I was taking chemotherapy and blooming now. I still listen to Yuming’s songs very often and I am listening right now as I write this. 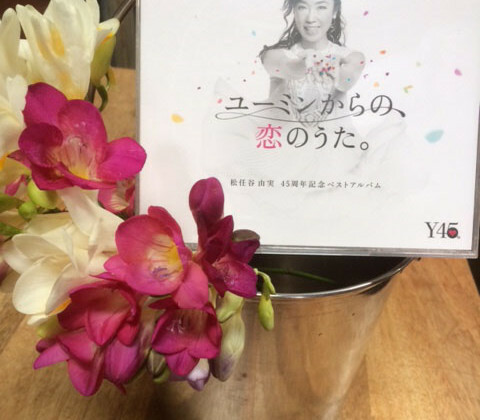 I found out that Yuming has started her 45th-anniversary tour, and she’d added an extra show in my hometown of Nagoya on December 30 last year. The only way to purchase a ticket was by lottery, so I said to myself: If I win, I am supposed to go just like I wrote on my bucket list. So, I entered the lottery. I could not believe it, but I won. I really wanted to go, but my health was not good enough yet. I was very sad, but I gave the tickets away. The new year came, and I was able to go see the new year sunrise, as I used to do until two years ago. 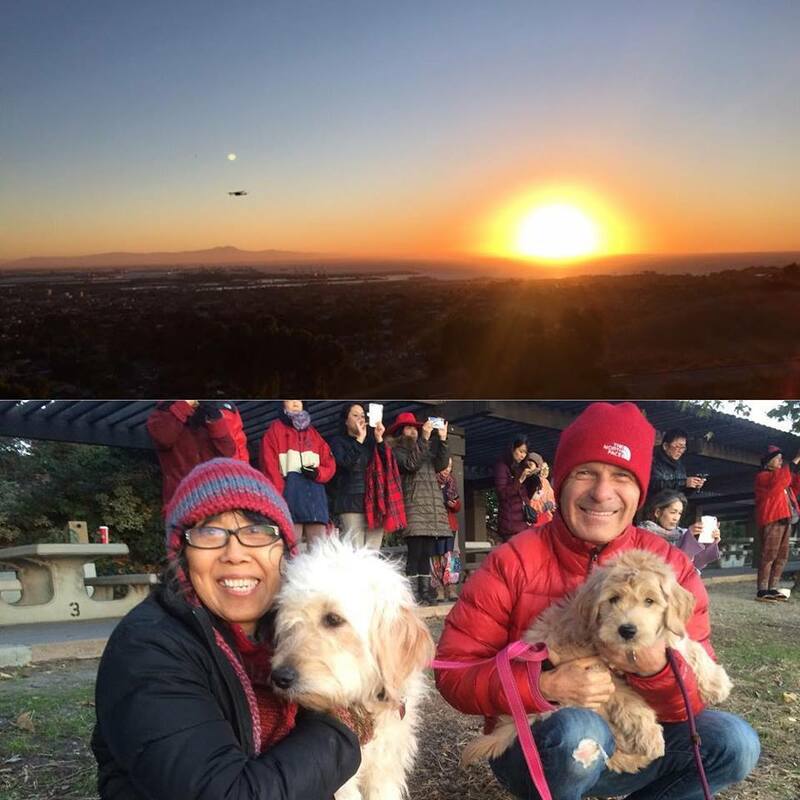 New Year Sunrise in 2019 with Eric, Kai and Nalu with other frineds. At the sunrise, I made a wish that I would win the lottery again and be able to go to Yuming’s concert in the spring. I felt heaven and even God supporting me, and I was so moved! My birthday is April 4, and the concert is on April 7. Going to Japan and Yuming’s concert are gifts for my birthday and my survival. I’d prayed that my most recent CT scan results would be good, and when I received the news from my oncologist, I was so happy. The mass of lymphoma in my liver is now only 2.8 cm x 2.5 cm (it was 13.8 cm x 8.2 cm two years ago), and I have no new lesions. I have not taken any medication since chemotherapy. 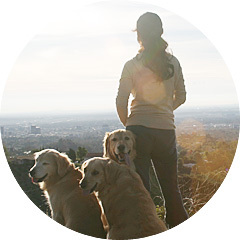 I make remedy drinks, cook macrobiotic foods, do my body scrub, exercise (walking with my dog family, yoga, qigong, do-in, etc. ), and do moxibustion, reiki, and other holistic modalities. I also started helping other people who need my healing work. I am so grateful to be able to share my experience with others once again. There were times I was depressed and impatient because I was not able to go places I wanted to go and do the things I wanted to do. Blamed myself for getting another cancer even it was after 24 years and I was doing macrobiotics with my best ability. Suffering from what other macrobiotic teachers/people/students said. Started to doubt what I was doing was not good enough to get well. Got lonely that I can’t see my friends as I used to, also was jealous of seeing everyone going to many places on FaceBook and Instagram, but I could not. But I knew the deep down inside of me that it was important for me to focus on getting better and acknowledge all these feelings even they were not comfortable feelings. I am truly happy to see that the seed of recovery that has been sprouting and growing. Now my top bucket list item is “To know when to let myself take a rest, not do too much, and fulfill my bucket list slowly but surely”. so how about writing what your heart desires and making your dream come true?